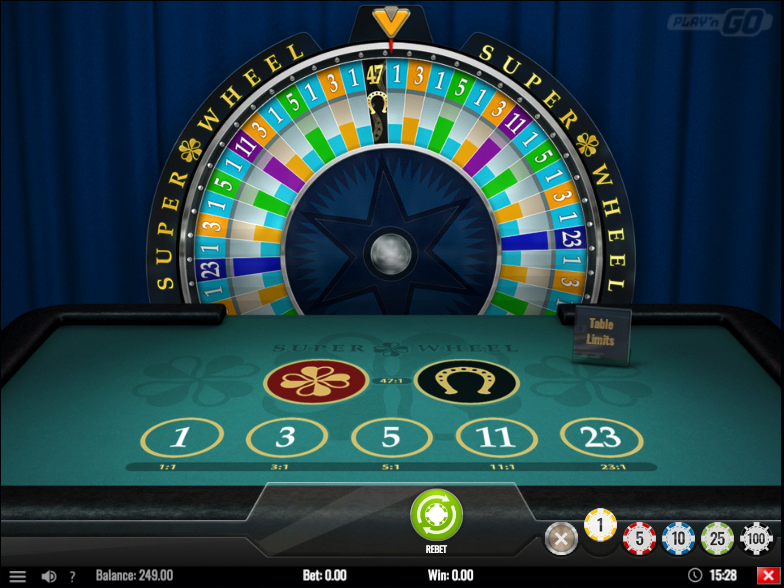 If you’d like a break from the online slot machines but don’t actually want to leave the casino then there are various other diversions which may amuse and potentially offer prize money; Super Wheel is a simple game worth checking out – it’s based on the Wheel of Fortune and you find out how to play it in our review below. Super Wheel plays out on a stretch of green baize on which are various betting options and their associated odds; in the background is the all important wheel which will spin and land on a segment – hopefully making some money in the process. While these are the basic odds you can of course place bets on more than one option which will widen the betting possibilities. While you probably don’t really need any instructions we’re going to put them down in print anyway so the first thing to do is select your bet size using one of the five casino chips in the bottom right hand corner. Now just click in the appropriate section on the green baize – repeat this action if you’re feeling lucky and want to place a second bet. When you’re satisfied with your betting choices just press the big green ‘Spin’ button at the bottom of the screen and the wheel will start to spin, gradually slowing down and stopping with some satisfying and realistic mechanical noises. If you’re a winner – congratulations, if not then why not have another go! Super Wheel is a simple but attractive way to spend some of your valuable casino time, especially if you are a fan of Wheel of Fortune-style games; it comes with an RTP of 92.31%.